This article is about political meetings. For the geographic region, see Caucasus. For the purported ancestor of Caucasians, see Caucas. A caucus is a meeting of supporters or members of a specific political party or movement. The term originated in the United States, but has spread to Australia, Canada, New Zealand, South Africa and Nepal. As the use of the term has been expanded, the exact definition has come to vary among political cultures. 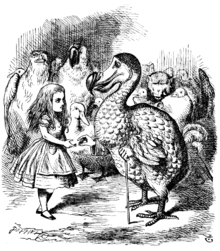 Lewis Carroll mocked the futility of caucuses in "A Caucus-Race and a Long Tale", Chapter 3 of Alice's Adventures in Wonderland (1865): when the "Caucus-race" of running in a circle stops, everyone is declared a winner by the Dodo and Alice is told to hand out prizes to all others, receiving her own thimble as her prize. The origin of the word caucus is debated, but it is generally agreed that it first came into use in the British colonies of North America. This day learned that the Caucas Clubb meets at certain Times in the Garret of Tom Daws, the Adjutant of the Boston Regiment. He has a large House, and he has a moveable Partition in his Garrett, which he takes down and the whole Clubb meets in one Room. The Origin of the "Caucus"
The presidential nominating convention is a modern institution. In the early days of the Republic a very different method was pursued in order to place the candidates for the highest office in the land before the people. In the first place, as to the origin of the "caucus." In the early part of the eighteenth century a number of caulkers connected with the shipping business in the North End of Boston held a meeting for consultation. That meeting was the germ of the political caucuses which have formed so prominent a feature of our government ever since its organization. No wholly satisfactory etymology has been documented. James Hammond Trumbull suggested to the American Philological Association that it comes from an Algonquian word for "counsel", 'cau´-cau-as´u'. The word might also derive from the Algonquian cawaassough, meaning an advisor, talker, or orator. This explanation was favoured by Charles Dudley Warner. The American Heritage Dictionary suggests that it possibly derived from medieval Latin caucus, meaning "drinking vessel", such as might have been used for the flip drunk at Caucus Club of colonial Boston. An analogical Latin-type plural "cauci" is occasionally used. The term caucus is also used in mediation, facilitation and other forms of alternate dispute resolution to describe circumstances wherein, rather than meeting at a common table, the disputants retreat to a more private setting to process information, agree on negotiation strategy, confer privately with counsel and/or with the mediator, or simply gain "breathing room" after the often emotionally difficult interactions that can occur in the common area where all parties are present. The degree to which caucuses are used can be a key defining element, and often an identifier, of the mediation model being used. For example, "facilitative mediation" tends to discourage the use of caucuses and tries to keep the parties talking at a single table, while "evaluative mediation" may allow parties to separate more often and rely on the mediator to shuttle information and offers back and forth. Precincts from Washington State's 46th Legislative District caucus in a school lunchroom (2008). In United States politics and government, caucus has several distinct but related meanings. Members of a political party or subgroup may meet to coordinate members' actions, choose group policy, or nominate candidates for various offices. There is no provision for the role of political parties in the United States Constitution. In the first two presidential elections, the Electoral College handled nominations and elections in 1789 and 1792 which selected George Washington. After that, Congressional party or a state legislature party caucus selected the party's presidential candidates. Nationally, these caucuses were replaced by the party convention starting in 1832 following the lead of the Anti-Masonic Party 1831 convention. The term caucus is frequently used to discuss the procedures used by some states to select presidential nominees such as the Iowa caucuses, the first of the modern presidential election cycle, and the Texas caucuses. Since 1980 such caucuses have become, in the aggregate, an important component of the nomination process. The term is used in Australia, Canada, New Zealand and South Africa. However, when used in these countries, "caucus" is more often a collective term for all members of a party in Parliament, usually called a parliamentary group, rather than a word for a regular meeting of these Members of Parliament. Thus, the Australian Federal Parliamentary Labor Party is commonly called "the Labor Caucus". The word was introduced to Australia by King O'Malley, an American-born Labor member of the first federal Parliament in 1901; it presumably entered New Zealand politics at a similar time. In New Zealand, the term is used by all political parties, but in Australia, the term is used only by the Australian Labor Party. For the Australian Liberal, National and Green parties, the usual term is "party room". In South Africa all parties use the term caucus. In Canada, caucus refers to all members of a particular party in Parliament, including senators, or a provincial legislature. These members elect among themselves a caucus chair who presides over their meetings. This person is an important figure when the party is in opposition and an important link between cabinet and the backbench when the party is in government. In a Westminster System, a party caucus can be quite powerful, as it can elect or dismiss the party's parliamentary leader. The caucus also determines some matters of policy, parliamentary tactics, and disciplinary measures against disobedient MPs. In some parties, the caucus also has the power to elect MPs to Cabinet when the party is in government. For example, this is traditionally so in the Australian Labor Party and the New Zealand Labour Party. The term "caucus" is not generally used in contemporary United Kingdom politics, other than as an occasional loose synonym for a political clique or cabal. In the UK and the Republic of Ireland (not a Commonwealth country), the usual term for all members of a party in Parliament is "parliamentary party". However, the word "caucus" did have wide currency in the UK in the late 19th century, in reference to a highly structured system of management and control within a political party, specifically the Liberal Party. Originally a pejorative term (with overtones of corrupt American practices) used by detractors of the system, the name was soon adopted by the Liberals themselves. The system had originated at a local level in Birmingham in preparation for the 1868 general election, when, under the 1867 Reform Act, the city had been allocated three parliamentary seats, but each elector had only two votes: in order to spread votes evenly, the secretary of the Birmingham Liberal Association, William Harris (later dubbed the "father of the Caucus") devised a four-tier organizational structure (of ward committees, general committee, executive committee, and management committee) through which Liberal voters in different wards could be instructed in the precise combinations in which to cast their votes. In 1877 the newly formed National Liberal Federation was given a similar structure, on the initiative of Joseph Chamberlain, and again devised by Harris. Shortly afterwards the term "caucus" was applied to this system by The Times newspaper, which referred to "the 'caucus' with all its evils", and by the Conservative prime minister, Benjamin Disraeli. The Liberal Caucus was also vilified by socialists, who (prior to the establishment of the Independent Labour Party) sought a route to parliamentary representation through the Liberal Party, but found their way barred by its management structures. Moisey Ostrogorsky devoted some nine chapters of his Democracy and the Organization of Political Parties (1902) to discussion of the development and operation of the "Caucus" in this sense. In conventions, where the membership from different parts of the organization may gather, each separate group within the organization may meet prior to the convention as a caucus. Each caucus may decide how the group would vote on various issues that may come up at the convention. Unless the votes are made binding, however, each delegate is still free to vote in any fashion. ↑ "Party CAUCUS: The word and its history". community.middlebury.edu. Retrieved 2016-02-26. ↑ "Founders Online: Boston Feby. 1763.". founders.archives.gov. Retrieved 2016-02-26. ↑ Sylvester, Ellis, Edward; Reed, Thomas Brackett; Wilson, William Lyne; Sherman, John (1896). Great Leaders and National Issues of 1896: Containing the Lives of the Republican and Democratic Candidates for President and Vice-president, Biographical Sketches of the Leading Men of All Parties ... Famous Campaigns of the Past, History of Political Parties, Lives of Our Former Presidents, Together with a Full Presentation of the Live Questions of the Day, Including the Tariff, Gold and Silver, Cuba, Armenia, Venezuela, Monroe Doctrine, Etc. International Publishing Company. p. 17. ↑ J.L. Bell, ""Boston 1775: Colonial Boston Vocabulary: 'caucus,' part 2"
↑ Wilson, James (1999). The Earth Shall Weep. New York City, NY: Atlantic Monthly Press. pp. 104–105. ISBN 0-87113-730-5. ↑ "caucus". American Heritage Dictionary (4th ed.). Boston, MA: Houghton Mifflin Company. 2000. ↑ "Cauci? > National Conference of State Legislatures". www.ncsl.org. Retrieved 2016-02-26. ↑ "ADR – How to Get Through Your First Mediation and What You Expect". www.cdc.gov. Retrieved 2016-02-26. ↑ Shafer, Byron E, (1988). "Emergence of the Presidential The Nomination and the Convention". Bifurcated Politics: Evolution and Reform in the National Party Convention. Harvard University Press. p. 11. ISBN 0674072561. Retrieved February 1, 2016. ↑ Weigel, David (2016-01-23). "Iowa caucuses: Here's how the voting works". The Washington Post. ISSN 0190-8286. Retrieved 2016-02-26. ↑ Redlawsk, David P.; Tolbert, Caroline J.; Donovan, Todd (2011). Why Iowa? : How Caucuses and Sequential Elections Improve the Presidential Nominating Process. University of Chicago Press. ISBN 9780226706962. ↑ "The Establishment Of The Federal Labor Caucus". australianpolitics.com. Retrieved 2016-02-26. ↑ "Chapter 7 Parties and Government". www.parliament.nz. New Zealand Parliament. Retrieved 2016-02-26. ↑ "The ANC Parliamentary Caucus". www.anc.org.za. Parliament of the Republic of South Africa. Retrieved 2016-02-26. ↑ "What's a caucus anyway? 3 things to know". www.cbc.ca. Retrieved 2016-02-26. ↑ "Parliament of Canada – A Week in the House of Commons". www.lop.parl.gc.ca. Retrieved 2016-02-26. ↑ Garvin, J. L. (1932). The Life of Joseph Chamberlain. 1. London: Macmillan. pp. 254–5. ↑ Briggs, Asa (1993). "Birmingham: the making of a Civic Gospel". Victorian Cities (3rd ed.). Berkeley: University of California Press. pp. 184–240 (190–1). ↑ Garvin 1932, pp. 261–2. ↑ "[Leading article]". The Times (28966). 12 June 1877. p. 9. There is to be a sort of Liberal Parliament organized, which, in American language, seems intended to act as a great Liberal 'Caucus'. ↑ Chamberlain, J. (1 August 1878). "Political organization [letter]". The Times. p. 8. I observe that you, in common with the Prime Minister, have adopted the word 'caucus' to designate our organization. ↑ Owen, James (2014). Labour and the Caucus: working-class radicalism and organised Liberalism in England, 1868–1888. Liverpool: Liverpool University Press. ISBN 978-1-8463-1944-0. ↑ Ostrogorski, M. (1902). Democracy and the Organization of Political Parties. 1. Translated by Clarke, Frederick. London: Macmillan. pp. 161–249, 329–441, 502–529, 580–627. 1 2 3 Robert, Henry M.; et al. (2011). Robert's Rules of Order Newly Revised (11th ed.). Philadelphia, PA: Da Capo Press. pp. 605–6. ISBN 978-0-306-82020-5. Look up caucus race in Wiktionary, the free dictionary. Look up caucus in Wiktionary, the free dictionary. Wikisource has the text of the 1905 New International Encyclopedia article Caucus. "Caucus". Encyclopædia Britannica (11th ed.). 1911.